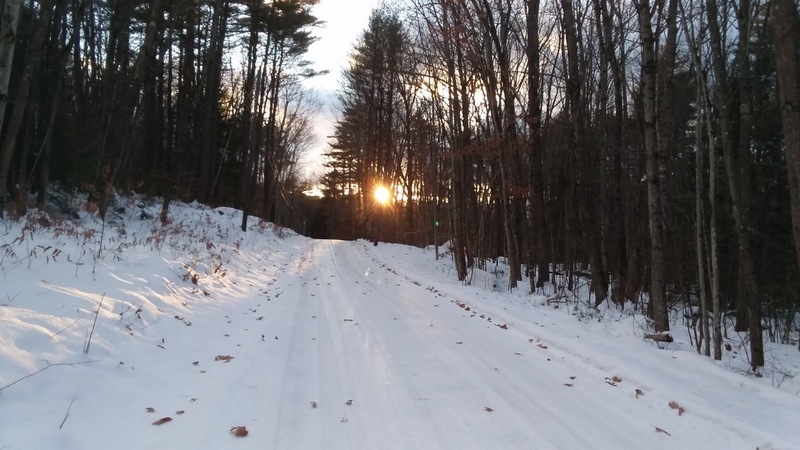 Astronomical winter arrived on Thursday morning at 11:28 am, the moment when the northern hemisphere receives the least amount of sunlight due to the tilt of the earth's axis of rotation and its orbit pointing the north pole away from the sun. I decided at the last minute - since it was such a gorgeous day - to watch the solstice from the summit of Red Hill in Moultonborough, so took a quick hike up the summit. Here's the view at 11:28 am. Being so close to noontime, this is also the highest the sun rises this time of year, quite a bit different from summertime. Remember, the tilt of the earth doesn't change over the year, just its orientation to the sun as we travel around our energy source. Here's a depiction from the Encyclopedia Britannica. It was a beautiful blue-sky day, clear enough to see the windmills on the mountains behind the old Tenney Ski Area, which is planning to open this winter after being closed for many years. You can see some of the restored ski trails in the left third of the picture. We've been getting regular snow falls to keep the snow lovers happy - at least until yesterday's rain which really messed things up. But the forecast is for more snow tomorrow to freshen things up again. Back at Lake Wicwas the ice is now thick enough for skiing and I have seen tracks of others out on the ice, though I personally haven't yet ventured across the areas of the lake that were last to freeze up. I've also seen fox tracks on the ice for the first time this year; somehow they seem to know when it is safe without benefit of cutting a hole. 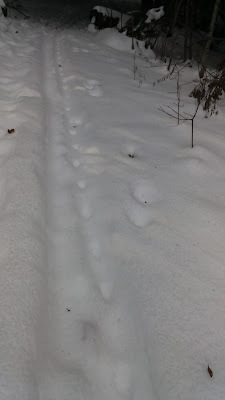 I'm always amazed at how quickly the fox will take advantage of ski trails to ease their travel across the snow. The fox is all about conserving energy, which makes sense considering it spends its life cruising the forest in the cold and dark of winter in search of a tiny morsel of protein to survive. The small amount of energy saved by walking in a packed track, multiplied by 20,000 steps a night, is a big advantage to its survival. That's also why it evolved with a perfect direct-register gait where its hind foot falls directly on top of where its front foot landed, and why its mate will follow exactly in the lead fox's trail. I read an article recently (thank you JS!) 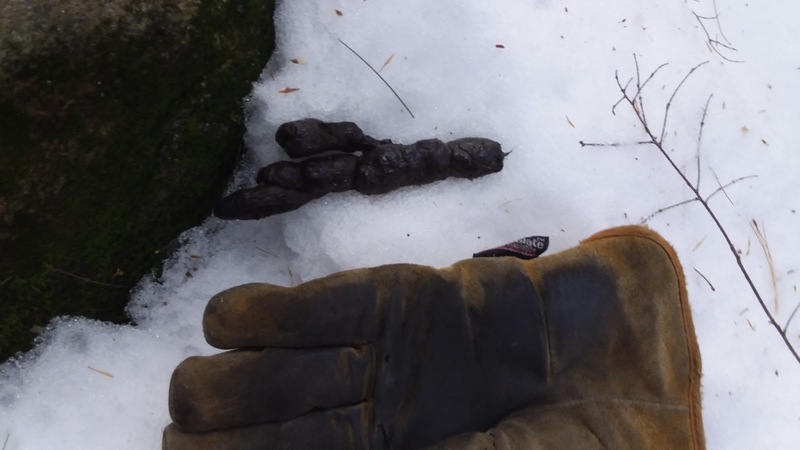 about someone tracking a fox up the Champney Brook Trail on the north side of Mount Chocorua. He observed that the fox completely ignored the track of every mouse that it passed by, it's perfect gait not having the slightest hitch meaning it didn't even turn its head to consider following the trail. Yet at another spot it stopped dead in its track with no sign of activity anywhere. 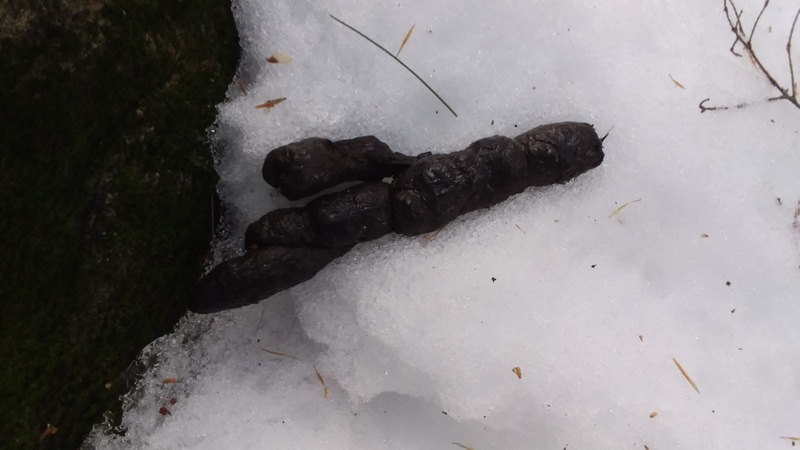 It then turned off the trail, walked in a much different pattern - slowly and quietly - before pouncing down into the snow. There was a lot digging, but no signs of a capture, and then the trail continued on. The explanation the author gave was that if a fox followed every track it saw or smelled, it would consume far too much energy chasing old, non-productive trails. It doesn't even bother to look at these. Instead, the fox hunts by sound, listening for definitive proof that its prey is present. Trotting silently through the snow, it will hear a mouse scratching around under the snow looking for seeds. It will stop, circle around the spot, and use its sharp hearing to pinpoint the exact location of the sound. It then quietly approaches and pounces down, hoping to catch the animal with its paws. It's a clever energy-conserving scheme developed over thousands of years of evolution. I have only seen evidence of this myself once, on the trail up to Crockett's Ledge; think about how many miles a fox much cover in a frigid night to find enough nourishment to live for another day. But we know it does, as right on the trails one finds proof of a fox's hunting success. I hope everyone has a peaceful Christmas tomorrow with family and friends, and remember, with the solstice behind us, we're already on the road to summer! December 31, 2017 - Happy New Year!